Many myths surround the use of chicory in coffee blends. One story holds that the root was accidentally found to be a flavorful additive to coffee as far back as the sixteenth century. Chicory is made from the root of the endive plant and was used as a filler and flavor enhancer in parts of northern Europe at least as far back as the eighteenth century. Napoleon's armies reportedly brought chicory back to France, where Parisians began to prefer its taste and the thriftiness of adding chicory. 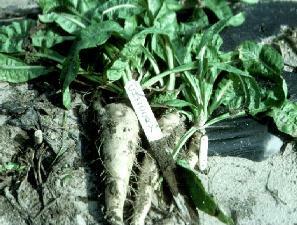 Since chicory could be grown in parts of Europe where coffee could not, the root was obviously cheaper. How it made its way to the United States is unknown. For many years it was used to stretch coffee supplies, especially in hard times such as the Civil War. This practice upset many purists, who disdained chicory and other additives. Somewhere along the way, however, New Orleanians developed a taste for chicory in coffee blends and many prefer it today. Throughout the New Orleans area, chicory has been used as a flavor additive. Local coffee companies have kept up with demand by offering the same blends with and without chicory. Within the city, coffee and chicory are consumed in greater quantities than anywhere else. Outside of the city, most coffee drinkers imbibe pure coffee instead. Concentration varies from 10-30% in most commercial blends.